Amazing what a good, old fashioned case of food poisoning can do for one’s reading. It’s also a sad statement I actually consider this a positive. Biblioholism, anyone? Snow Books (UK) very kindly sent me a review copy of Sarah Bryant’s lushly gothic novel set at an antebellum home in Louisiana, and despite the size of it (459 pp.) I positively flew through the book. The book begins with twin sisters, Eve and Elizabeth, switching identities so one may marry the man she loves. Having traded identities so often in childhood, with nary a suspicion from their parents, they figure switching for a mere bridegroom will be no problem at all. With lightning flashing and thunder rumbling in the background, they complete the exchange of the wedding dress and the sisters’ identifying necklaces. A generation later Eleanor Rose, the daughter/niece of Eve and Elizabeth, is plagued by recurrent nightmares about her mother and aunt. In all her dreams both women are in dire peril at the hands of a mysterious man, and both call desperately for her help. Strangely, it’s her aunt Eve who seems to be appealing to her most desperately in her dreams, a fact she can’t quite reconcile. Why is it her aunt Eve and not her mother? Eleanor, raised by her grandfather, is an indulged and privileged child who’s also a prodigy on the piano. Her grandfather takes her to music concerts where she hears the greats play. At one of these concerts she sees Alexander Trevozhov perform. She’s immediately smitten. Eleanor moves into one of the smaller houses on the estate, as Eden House is in such a state of disrepair. She is immediately plagued by insomnia. Already pale and wan following the sudden loss of her beloved grandfather, she becomes even more sickly looking. Not long thereafter a man arrives to rent one of the houses on the property. The man is none other than Alexander Trevozhov, arriving with is niece Natalya. Coincidence or orchestration, you may ask? Well, some things are best not revealed. Trevozhov appears somewhat aloof and mocking at first, but soon warms to Eleanor. He reveals that he, too, has been having strange dreams and their fates seem inexplicably intertwined. He’s able to recite specifics from her dreams, a fact that leaves Eleanor baffled. Who, exactly, is this Alexander Trevozhov, and how does he know the details of the dreams that terrify her? Eleanor begins exploring Eden House. Locked doors become unlocked, and unlocked doors are suddenly fast closed, as she wanders through the big house. Her feeling of unease mounts, despite her vain attempts to rationalize the things happening around her. A piano she originally found under a dustcover, unused for ages, begins playing a familiar piece when there’s apparently no one in the house but herself. Eleanor begins to feel she’s losing her grip. Is there truly a legacy of insanity in her family? Enter Dorian Ducoeur, a former friend of the family who knew both Eve and Elizabeth, and things really start to heat up. Dorian, Eleanor discovers, is one of the figures from her nightmares. Alexander’s back is immediately up. He doesn’t trust this man and makes no bones about it. Who is Dorian Ducoeur, really, and what does Alexander really know? Apparently he knows more than he’s at first willing to reveal. Telling much more would be spoiling the rest of the plot. Suffice to say there are more delightfully mysterious house rambles to come, more lush, beautifully-written descriptions of the wonderfully gothic Eden House, and even a death or two for good measure. There are also more shocking revelations, and many more layers added to the tale of Elizabeth and Eve, before all is said and done. Heavily influenced by the gothic classic Jane Eyre, Sarah Bryant’s strength is in her description. She imagines a nicely complex plot, but her slips into melodrama are her weakness. However, with writing so atmospheric and evocative of the steamy Deep South the reader can forgive her the occasional slip into purple prose. On the strength of this effort I would most definitely read another book by Bryant. Despite its length The Other Eden demands you read it at a gallop. There’s no slowing down as each element is revealed, peeling away the layers of the mystery and simultaneously building the suspense to nearly unbearable proportions. You won’t want to stop until the last page is turned. As a good summer read I would very highly recommend The Other Eden. 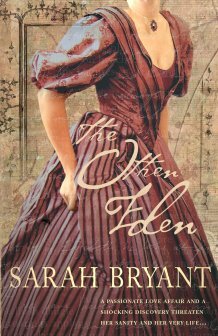 For Sarah Bryant’s other works, see her Amazon author page. Previous Post Auto + Audio = Blissful Silence!